Prepare to explore and set sail to some of the world’s most scenic coastlines and culturally enriching destinations aboard Azamara Club Cruises’ majestic vessels, Azamara Quest and Azamara Journey. Redefining luxury cruising, Azamara Club Cruises is a five-star brand that resembles a boutique hotel at sea, offering luxurious amenities, superb entertainment, and gourmet dining – while being transported to exotic ports of call and splendid itineraries – one of their most enticing features. This past year, Azamara Journey and Azamara Quest underwent major enhancements and renovations which include extensive upgrades to all their suites and staterooms, public spaces, as well as the restaurants, spa, and outdoor spaces. 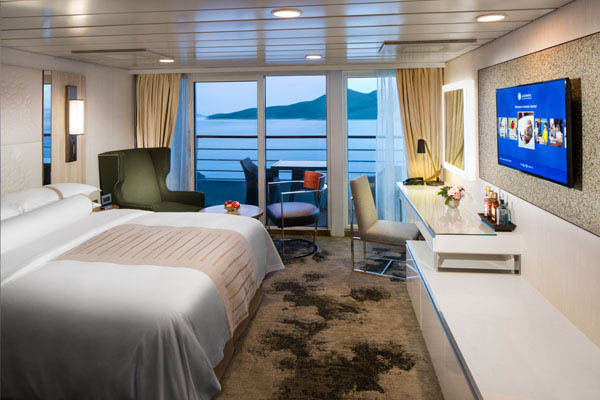 The overall interiors and color scheme of the public spaces and cabins bring a modern elegance and airy feel to the ship with plenty of light-colored carpeting, plush fabrics, and earth tones with touches of chrome and modern art work. Beyond the contemporary yet timeless interior renewals, upgrades to ship technology bring both vessels into the present with interactive features like a 90-inch, touch-screen console called the Inspiration Center that allows guests to playfully learn about future voyages and their excursion offerings at these exciting destinations. From bow to stern, these vessels now showcase a blend of contemporary and classic designs organically inspired by the dazzling landscapes and bodies of water they circumnavigate. Elegant yet comfortable, these ships are the ideal home away from home from which to enjoy your adventure. 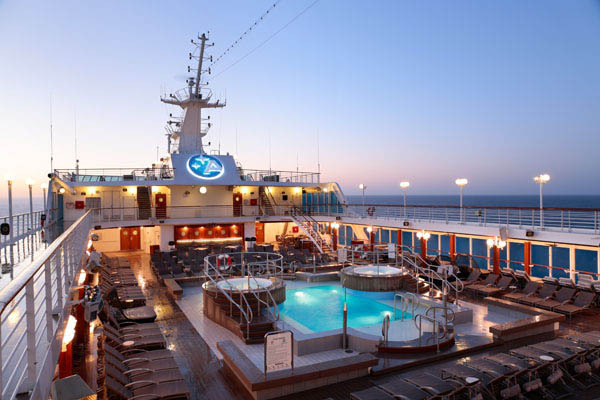 Perfectly sized, Azamara Journey and Quest accommodate 690 passengers and are ideally sized for docking at smaller more exclusive harbors like Portofino as well as 180 additional ports which makes these ships appealing for seasoned cruisers seeking an upscale and distinctive experience. Azamara takes pride in their numerous loyal guests, members of Le Club Voyage, returning year after year, some remaining on board for months at a time since the ships continue sailing to new ports, without repetition of a single one for months at a time. With voyages to the Caribbean, Europe, Asia, Australia, or South America, the world is your oyster. Explore the mysteries of the Far East, repose on the pristine beaches of the Caribbean, or make your way to the Mediterranean where you can select one of their many voyages sailing from Italy to Greece. 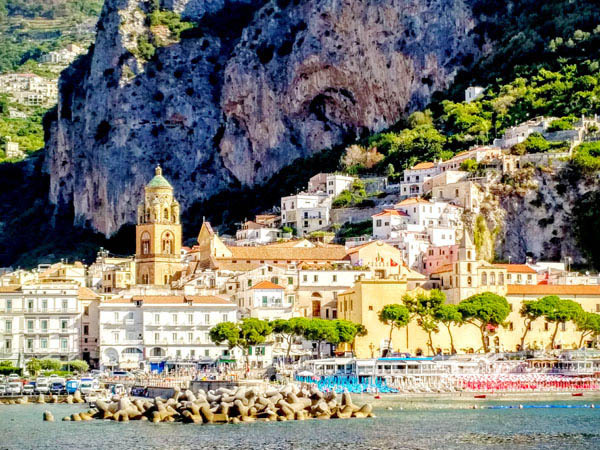 A popular option, this particular cruise departs from Rome, sails to Sorrento (or Salerno in case of high winds) from which you can embark on one of many Land Discoveries to explore the exquisite Amalfi Coast or board a jetfoil to Capri to experience life as a jetsetter. The next ports of call include the historic Taormina in Sicily; Valletta in Malta; Siracusa back in Sicily; Katakolon and Nauplion in Greece, and a final disembarkation in Athens. One of the many highlights on this itinerary includes a day trip from Sorrento to discover the magic of nearby Capri. A playground for Roman emperors, the rich and famous, artists, and writers, the picturesque island of Capri continues to be one of the Mediterranean’s most beloved destinations. Perched 1,000 feet above the Bay of Naples on this famously exclusive and charming island, Hotel Caesar Augustus is one of the island’s gems situated on the more quiet side of Anacapri. 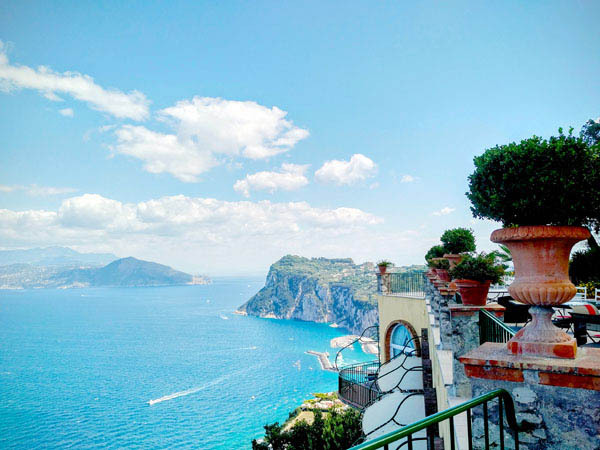 It offers one of the most beautiful panoramas in the world – sweeping views over the entire Bay of Naples, Mount Vesuvius, Sorrento and the neighboring island of Ischia. It’s the perfect glamorous hideaway for relaxation and enjoyment for which the Italians are so well known for. Once a Russian Prince’s cliff-edge summer mansion, this now five-star boutique hotel was inspired by true Italian grandeur and beauty, reflecting a harmoniously balanced design aesthetic.The pristine public areas and the gorgeous sun-drenched gardens ooze sophistication and elegance, not to mention its iconic, Roman statue-decorated main terrace which has been immortalized on countless postcards. Other nearby attractions include Villa San Michele, Grotta Azzurra, and the Monte Solaro Chairlift, as well as a number of beautiful beaches and walking trails. If all the island exploration has left you in need for some relaxation, the spectacular bi-level infinity pool is the perfect spot to laze around while gazing out towards Mount Vesuvius. Then head over to savor the delectable dishes at La Terrazza di Lucullo, the hotel’s demi-lune cliff top restaurant offering both indoor and outdoor seating. The menu is everything you would expect from an award-winning chef, an exciting fusion of traditional regional specialties creatively updated with contemporary Italian dishes, made with locally-sourced products and ingredients grown in Hotel Caesar Augustus’ organic kitchen garden. Expect to find yourself savoring the local flavors while surrounded by the most breathtaking scenery and exceptional service for an unforgettable experience. Back on board the Azamara Journey, relax on one of the posh loungers on the top deck from which you can watch the ship sail past the perfectly sheer cliffs and a rugged shoreline dotted with small beaches and pastel-colored fishing villages to the next port of call. As you awaken to a new port, ready for exploration, rest assured that you will have plenty of exclusive excursions to select from thanks to Azamara’s in-depth knowledge of every port’s highlights and authentic offerings. Regardless of your activity level or interest, you will find plenty of engaging options to take in the beauty and culture of each destination. And if there is something not offered, visit the concierge desk to customize your very own specially tailored excursion.